When I grew up my mum had limited work from home opportunities, most were party plan or MLM. Now, with the internet and changing lifestyles, there are so many things you can do to make money from home. This list focuses on options which are not party plan, and many of them can be done at the same time giving you multiple streams of income. Make sure you check regulations for wherever you live before doing anything. I always looked for ways to make money from home, even as a teenager, doing everything from online surveys to renting a room to a boarder, party plans such as Tupperware through to freelance writing and blogging. Follow The Thrifty Issue on Facebook, follow on Twitter, join our Facebook Group or get daily saving tips on Instagram. 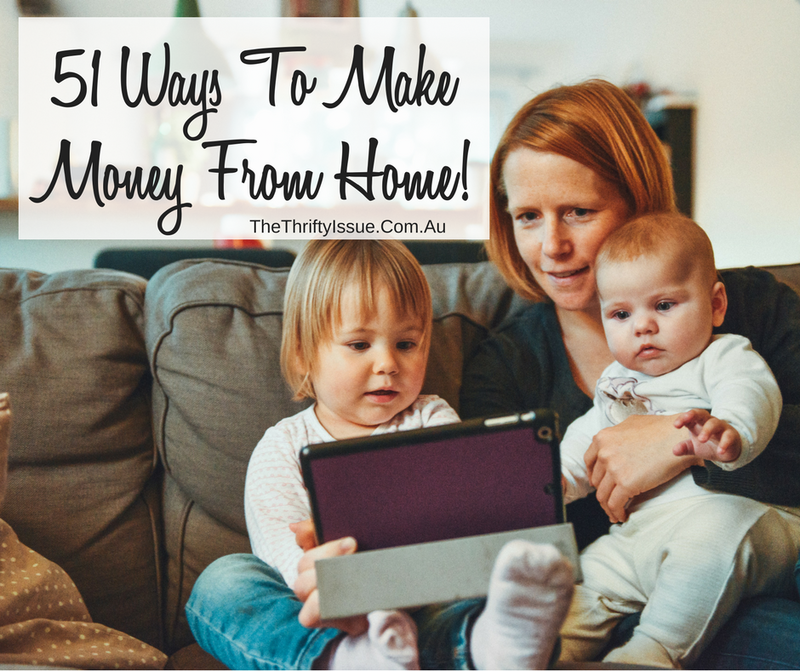 In 51 ways to make money from home I cover online survey sites I have used, how to make money from your house such as renting a room on AirBnB, making money from social media, blogging, freelance writing, graphic design, being a virtual assistant, domestic options such as ironing, childcare etc along with remote work, setting up your own business, renting things such as rooms, your car, furniture, garage and more. You can do multiple ideas at once to start generating money. Each idea has an approximate income and many have links for more information or step by step guides. Skip through to find the ones you want to try. *Disclosure – some are affiliate links to things I have personally done. For my full disclosure policy click here. Swagbucks is my favourite. You can do it via their app or on your computer. You earn “Swagbucks” which you convert to cash or gift cards. I have been using them for a few years and while not a huge moneymaker, I use them for things I already do so the points add up. It’s free and easy to join, plus often they have sales on the gift cards you can redeem. For example, 5,000 points is usually a $50 gift card or cash. Big W and a few others are on sale at times so you spend 3,900 points ($39) for a $50 gift card, making points go further! Sign up free here. I only started with them this year but they have proven to be my most profitable option out of all of the ones I have tried over the years. Surveys are usually quick, you can get paid out in cash or choose egift cards and the customer service is fantastic! I have averaged $100 per month, however, some of that is referral income too. Sign up free here! This is a new one I use as an app on my phone. It’s easy, the pay is decent and it can be done anywhere. I have only been doing it a month, so can’t say how much you might earn. Click here to sign up now. I have averaged about $20 a month when doing it consistently, mainly through clicking on their emails. You can earn more depending on what you are willing to sign up to, how many surveys you answer and if you want to shop through them to earn a percentage of your shop. You also earn cash every 6 months for updating your profile. Pureprofile is an online survey platform which also now has an app. You can redeem up to $50 every 60 days either as cash, gift cards or Hoyts vouchers. You earn cash doing surveys. You are matched to survey’s based on your profile (which does take some time to fill out). Surveys can be as little as $2 or the most I have seen is $25 for one survey. Some take a few minutes, others take an hour (rare and those are the ones that pay $25). I mostly see between $3 and $10 for surveys. You will have to answer a few questions at the start of each survey to see if you definitely fit what they need for that survey and to ensure they fill their quotas for different ages, genders, locations etc. If you fill this out and don’t get through to the survey for any reason you usually get paid 5 cents or 10 cents anyway. MyOpinions – it used to require a lot to make any money, apparently, this has changed. Purkle – I have never made a cent but others swear by this one! Your Voice – I used to make money from them but haven’t for a while. You can find my list of Australian online survey sites with more detail here. I get a lot of offers through Farron for market research options either at home, on the phone or occasionally in the office. Most are around $100 an hour and fairly easy to do. I have been with Social Soup for years. Most of the offers have been a product, usually worth $20 to $100. Once I was selected for a focus group worth $125. Now they are an app so look them up on Google Play or the App Store. The rate will vary depending on where you live, whether it is a room or your whole house, what you offer and the time of year. Most people make $70+ per night with it increasing over certain periods. For example, the week of Christmas I could charge $180+ per night where I am. To find out more about renting a room on Airbnb check out this post or click here to sign up to Airbnb. I have rented rooms for $100 to $250 a week. This varies depending on the area you live in, if it is a master bedroom with its own bathroom and if the room includes bills. Do research in the area you live in to see what a room rents for. Having a longterm boarder is preferable for some as the income is regular compared to variable income with Airbnb. Check out this post on renting a room to a boarder before you do it. I have rented my garage out to a single mum running a business who needed more space and parking spaces where I am rent for $50+ a week. You can rent it to someone who works nearby and needs it for work, someone needing to store a boat, special car or caravan etc. You can do this with either Spacer, ParkHound or do it privately. If you have a spare room or garage you can list it as mentioned above. However, you can also rent out your attic, basement if you have one, garage sheds, storage cages in apartment blocks, backyards, front yards and basically any space you have. They can be rented by people wanting to store items or in your yard, if your council allows, you can rent garden plots or camping space. If you have a pool, this could be rented out to people running swimming lessons or aerobics instructors. If you live on the main road or high traffic area, you can rent the space on your fence to businesses for advertising. They will need to supply and install their own signs. Alternatively, some people get free tickets to events for allowing advertising for tours such as circuses. If you have space and it is approved, you can either install a billboard or arrange with a company for them to install it and use your yard for advertising. This works best on main roads. I have made over $10,000 a month doing this. I have an eBook here which shares exactly how to do it. When I got back into it this year I aimed to make $20,000 for the year. You can see the first few posts on it here (under $3,000) and here (over $8,000). If you can put plants in pots, grow herbs or other veggies from seeds you can sell the plants. Selling herbs, fruit and vegetables you grow is another option or eggs and honey if you have chickens and bees. Etsy is a handmade market but it’s not limited to things you sew/craft/physical products, you can make graphics such as party invitations, blog themes, quotes, organisational tools like wall planners that people can purchase the digital file and print themselves. Digital files are fantastic because you make them once and can sell them multiple times. Clothing, jewellery, toys, home decor and graphics are all popular. How much you make depends on how popular the item is and how well you market it. For tips on setting up an Etsy store and selling, read this post. I hesitated to put this in because statistics show most people lose money with these options, no matter how great it seems. If it is a product you genuinely use and love, plus are great with direct sales, it can be a good option. Sites such as Car Next Door and CarHood allow you to rent out your car. People pay by the hour or can rent it for the day. It can sit out the front of your house, be used as needed and make you money without you needing to drive anyone around. Personally, I found Car Next Door had a more secure signup process. If you have a caravan or camper your family only uses a few times a year you can rent it out on sites such as Camplify. You set your rate, people book and use it then return it. They take 5% commission. Sites such as Airtasker have different things they need people to do for example, sell their stuff on eBay for them. Many of the tasks require you to leave the house, but there are some which can be done from home. People list things they need doing from domestic things like ironing through to online options such as liking Facebook pages, writing articles or doing marketing research. It’s free to join, you put in a bid on the jobs you want to do and if selected, you need to complete the tasks within a specified timeframe. Alternatively, check sites such as Gumtree, put up flyers in your local area or advertise on Facebook for anything you are willing to do from home. Sites such as OpenShed allow you to rent out anything from your lawnmower to your BBQ. Other sites such as Tree Hut Village enable you to rent out baby gear. Most administration skills can be done online from home such as emails, scheduling appointments, making payments, doing social media and more. With some experience or taking a course, you can either work for an agency or set up your own virtual assistant business. Find out how to get started here. Graphic design, video editing, creating graphics with Canva, social media posts and more are all jobs people offer on Fiverr. Set yourself up with an account then it is up to you how much you charge, what you do etc. While it was orginally meant ot be only services that were $5, that has changed and now you can charge anything plus upsell your services. Sign up to Fiverr here. Experienced writers are paid much more than $50 per article but until you have a portfolio and experience it is hard to get gigs that pay well. Freelance writing is not as simple as writing a quick article. It usually entails knowing SEO, good grammar and impeccable English, research on topics. It can be a great way to make money. How much you make depends on experience, the amount of time you want to commit, who you write for and what you want to charge. Find out more about freelance writing, ghostwriting and copywriting here. Blogging has been one of the best ways I’ve made money from home. You can make money from sponsored posts, reviews, affiliate links, banner ads and creating your own products. I make a fulltime income from it and have friends making over $100,000 a month. For a guide on how to set up a blog and ways to make money click here. Making money on Facebook, Instagram, Twitter and other social media platforms can be a full-time job itself. Generally, you need an account with an engaged following over 5,000. Once you have your following you can apply to influencer programs. Find out more (and check out programs here). Editing is a skill requiring more than simply looking for typos. Many large publishing houses outsource editing to remote workers, website owners, new authors, self-published authors, magazines and newspapers all need editors. Get some qualifications or experience before you launch. You can find work on Upwork or through Facebook groups. More people are outsourcing overseas for graphic designers so it is becoming harder. However, you can make money doing logos, business branding, social media posts or even media kits for bloggers. Prices for each service will vary and often it is best to diversify your skills, for example, create and post the social media content for clients for a set fee. Having a perfectly crafted resume and cover letter is essential for anyone looking for work. If you have a way with words, get some testimonials and can make a resume attractive, this is a sought-after service. Set your rates, choose your turnaround time and offer upgrades or packages with resumes, cover letters and selection criteria’s for maximum value. Transcription services used to mainly be used by lawyers and doctors, now social media influencers, podcasters, radio shows and more require this service. Prices are higher for a fast turnaround or if there is more than one person speaking, there is background noise etc. Being an author is not as hard as it used to be. You can either choose to self-publish through sites such as Amazon or pitch your idea to a large publishing house, with some having pitch days open to anyone to submit their work e.g. Allen and Unwin has a Friday Pitch option. Photography is one of the many creative pursuits that is often not valued as highly as it should be. To make money with photography at home you could set up your own studio and offer headshots, family photos etc. Otherwise, you can sell your images to stock photo sites, create cards, postcards and products such as pillowcases, canvas artwork or even scarves to sell. These products can be sold on your own site, via social media or on sites such as Etsy. Alternatively, you can offer photo editing for others, photography training online or at your home. Childcare is hard to come by in most cities, with many parents turning to at home child care providers instead. You will need to get certain qualifications to do it, possibly need to make changes to your home and do anything your area requires legally to run a business like this at home. Once you are set up, it should be easy to get clients. If you have an ironing board, iron and time, you can iron baskets of clothes while you watch your favourite TV shows or listen to podcasts. Generally, you charge per item, with rates typically $1.50 to $6 in my area. Don’t charge per basket as many people will cram as much as they can into one basket. Per item or flat folded basket seems to be the most common way of charging and ensuring it is fair to all involved. Have a tent set up in a room, your spray tan equipment and promote in your local area. You will need practice to make sure you do a good job, plus insurance and to know OH&S inside and out, but if you have approval from council and are confident you do a good job, you can easily do a few clients an hour when it suits. You must have the correct qualifications to do this. Many set up a room in their home with the massage table and do massage for clients on certain days. How much you charge depends on your local area, many are $40+ per half hour or $80+ per hour. Looking after pets in your own home can be a great option if you love animals and have the room. Rates vary depending on the area and what is required. You can charge for initial meets, before they stay with you, add extra services such as walking and pet grooming or offer pick up and drop off for a fee. You can find out more here. English, Math, music, sports think about what you can offer to tutor someone in, select the level (beginner, intermediate, advanced or go by age groups) then promote your services online and through school newsletters to get your clients. Tutoring can be done in your lounge, just make sure you have everything you need and all legalities covered. Do you have expertise or qualifications in a particular area? Consulting might be an option for you. How much you charge will depend on your industry and target market plus expenses such as your set up including website, social media, insurance and other business needs. You can offer packages instead of an hourly rate (this tends to be more common) and create courses, eBook sor other items to upsell. There are coaches or mentors for anything and everything now from business to divorce, life coaching through to parenting. Mentors and coaches are different, most charge much more than $50 per hour, instead, they offer packages at set rates with a certain amount of services included or they can tailor packages to their clients’ needs. Do you have expertise or qualifications in a particular area? Consulting might be an option for you. How much you charge will depend on your industry and target market plus expenses such as your set up including website, social media, insurance and other business needs. You can offer packages instead of an hourly rate (this tends to be more common) and create courses, eBooks or other items to upsell. If you can sew and have the room, alterations might be an option. People can come to you, you can offer mending or alterations and do it from the comfort of your own home. Some companies outsource their telemarketing to people working from home. Check employment sites to find these and research the company before you sign up. Investing in anything, if done smartly, will see your network grow and provide other income streams. For example, when investing in shares, you can be paid dividends which you can re-invest or choose to be paid directly. Eventually, if you build a good portfolio you can live off it in retirement. Acorns is an app that makes it easy. You join, get $2.50 immediately, plus deposit an amount you want then set up regular amounts to be deposited and invested. Either search remote work options and apply for those jobs or talk to your current employer to see if working from home is an option within the company. Point out the benefits to the company (less office space needed, fewer distractions etc) and discuss the options. It will likely be done on a trial basis so you will need to prove it works. It can be rewarding for you and them, though. Any time you shop online, you can potentially get a percentage of the purchase price back or a flat rate. Install one or all of the following then any time you shop you’ll get a notification, they’ll scan for discount codes or cash back options and with one click you get it! CashRewards – has numerous offers and cash back options, even for Woolworths, Apple and more. You join for free, add the extension to your browser and download the app then use it whenever you shop or search the site for specifics you want to see what offers there are. While not strictly a way you can make money regularly, it is a way you can make money doing something you already do and can result in thousands back in your pocket for basics like your grocery shopping. I have switched to doing most things online such as groceries, clothing, booking entertainment like movies etc. which means anything I do now, I get money back for. Send in jokes, stories or puzzles to magazines. Full stories can be worth up to $2,000 in some of the weekly magazines. This usually works best if you are a blogger or social media influencer, but you can still make some money from home promoting affiliates. For anything you do (e.g. have HelloFresh ordered, do online surveys, bank with ING etc) you will be able to log into your account and find a refer a friend code. You can share these on your personal social media accounts, through email to friends and family or in some Facebook groups. You can join the programs just to do this and not use the services too. There are people who are viewed as professional ‘compers’, as in they enter every competition they can with many winning incredible prizes. Check out our freebies post for other freebies. Aside from Etsy, you can also create things to sell on sites such as RedBubble, MadeIt or create your own site. Read 12 steps to set up your business to get it right. What is stopping you from setting up your own business? If it’s money, check out this post to do it fir under $100! Sell things you make, offer services, set up a drop shipping company or manage services for others. The list of businesses you can have from home is extensive. Do some research to see what you would enjoy and get into it! At the moment I primarily have an eBook and an eCourse, both of which I have been quite bad at advertising so I’m barely making any money from home at the moment! But I did have other priorities so it’s something that I can work on in 2017. Be careful with pet minding. If you accept money or reward for dog or cat sitting in your own home, the Domestic Animals Act 1994 (DAA) requires you to comply with all aspects of home boarding in the DAA Code of Practice, which can be expensive & onerous eg compliant fencing. Lots of people don’t, which puts animal welfare & public safety at risk so consider if something goes wrong you may be fined or sued. The public liability on your home insurance may not cover you if you’re not registered as a domestic animal home boarding business with your council & aren’t in full compliance with the DAA Code of Practice. You don’t have to comply if you do it for free or no reward/gift but that’s not going to help you earn money at home! You can charge for looking after the pet in the pet’s home (ie house sitting or visiting 1-2 times a day to feed, walk or play) especially if you have good references. What about dog walking? Get your exercise and earn money at the same time! Thanks, Fiona. There are reputable companies you can apply through such as the one we linked to and as stated at the top of the post, you need to check regulations in your own areas.